While the volume and spread were pretty intimidating, it should be noted that the most immediate support level (shown above in blue) is currently holding. 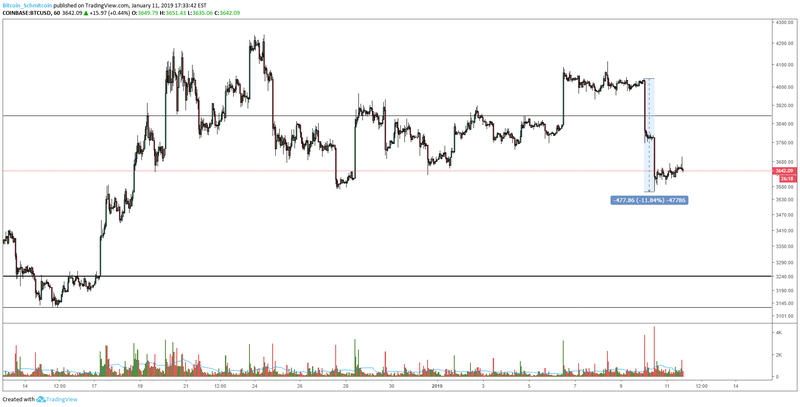 However, should this support level break, we should fully expect to revisit the support levels toward the bottom of the range in the low $3,000s. Until we see a daily close below the current support level, the trend model remains somewhat neutral. Although the market is swinging 10% in a day, the overall structure is neither bullish nor bearish. The BBands have been squeezing inward for days, which indicates the market has been consolidating — no surprise there since the market hasn’t really moved from its well-defined range. Looking at the daily BBands though, we do see the beginnings of a BBands expansion, indicating the market is done consolidating and is ready for its next major move. In our case, the BBands are hinting toward a downward continuation. If we manage to break the blue support level shown above, we could potentially see a strong continuation of the macro downtrend. As I stated before, I would like to see a close below the current support level before I go full-blown bear. Although the current market structure is neutral, it is starting to show the early signs of a strong bearish continuation. It’s also important to note that we are still in a bear market. Just because bitcoin saw a couple of weeks of strong demand, that does not negate the months and months of downward pressure. Bitcoin dropped 11% in one day as it finds itself testing its macro support level. We have yet to close a new low, but the BBands are showing the market is coiled and ready for its next major move. If we close below our current support level, the next logical test would be of the previous support level in the low $3,000s.